Tom Robichaud and colleague Ben search a vacant office for drugs. Ben bounds into the rooms of the vacant office space and circles them, sniffing for a substance mimicking the odor of cocaine that has been hidden for a practice demonstration. 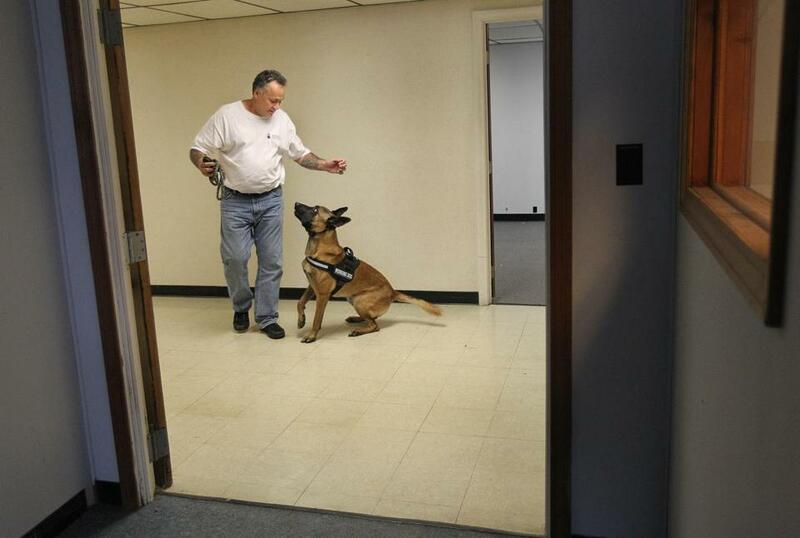 “Search,” encouraged his owner, Tom Robichaud, who recently started a confidential canine drug-detection business, Discreet Intervention, based in Wrentham. When the dog detects the substance, hidden in a false Coke can, a battery, and other containers, he sits, wags his tail, and waits for his reward: a burlap tug that serves as a chew toy. Robichaud’s new business will check for drugs for parents, employers, school officials or anyone else interested in a private screening. For a minimum of $400, plus travel time, Robichaud and Ben, a 3-year-old Belgian Malinois shepherd from Germany, will sweep an area for drugs, he said. The company will answer calls primarily from Massachusetts, New Hampshire, and Rhode Island. And unless it involves “a meth lab or 20 pounds of cocaine” that he would not be able to ignore, Robichaud said, he leaves it up to his customers to deal with any drugs that Ben finds, and with whoever is suspected of placing them there. It might be a son or daughter, a spouse, a student, or a resident of a halfway house, he said. Robichaud, who says he has been a dog trainer for 25 years and has helped police to purchase and train dogs, traveled to Missouri with Ben for a three-week stay to get certified in January. He is working on further requirements to be able to certify others. State Police spokesman David Procopio, after consulting with canine and legal authorities, said he knew of no other such business in the area, and said it was legal. Tom Robichaud, founder of Discreet Intervention, leads Ben through a practice search. He said police would encourage anyone who hires someone like Robichaud to turn in any uncovered drugs so the contraband could be properly disposed of, and because it could be part of a larger network. But, he said, it may be that only people who are legally mandated to report the discovery of drugs, such as a social worker, would be required to alert the authorities. Whitney A. Taylor, director of public advocacy for the American Civil Liberties Union of Massachusetts, said her organization does not object if people give permission for drug searches on their properties. However, she said, the practice is not a “silver bullet” for dealing with drug problems, and voiced some criticisms of canine searches, particularly in schools. Robichaud said he grew up in Newton, and lived in Walpole for 20 years and in Canada for two before moving to Wrentham in 2010. He worked briefly in 1994 for the Norfolk County Sheriff’s Department before his father fell ill and he left the department. He has primarily been self-employed, training dogs and doing private security work, as well as power-washing homes and decks to supplement his income. Phil McEnany, a patrolman with the Sharon Police Department, said he has known Robichaud since around 1990, meeting him through a friend. Robichaud helped him train his Belgian Malinois puppy. McEnany and his dog worked for a time with the Norwood Police Department. “It’s interesting,” McEnany said of Robichaud’s new business. He said he thinks there is a need for it among employers and parents who are apprehensive about calling the police and are wary of publicity. Because Robichaud uses a passive search method, rather than an active one, Ben does not claw at where the drugs are suspected. Generally, the owner takes the final step of removing the drug. “If the kids do drugs, that’s their business; my business is to find them,’’ Robichaud said. If required, he said, he can testify in court; one example would be for a custody case in which one parent finds drugs being used by the other parent. 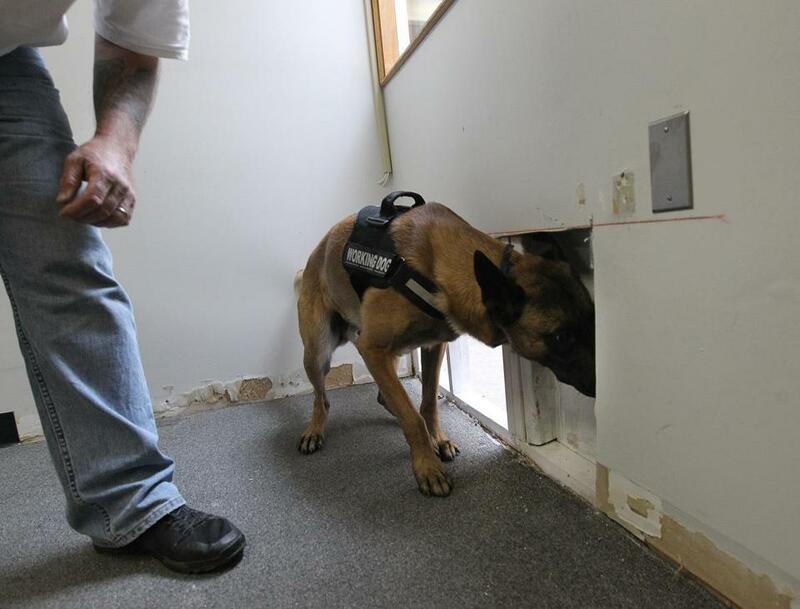 Gary LaFollette, owner of the LaFollette K-9 Training Center, just outside of Springfield, Mo., where Robichaud received his certification, said private drug detection is a growing business. He said law enforcement does not have the resources to make unlimited canine searches, and often the parties involved do not want police involvement. “They want to handle it internally,” he said. Robichaud said he lost a brother to a drug overdose in 2001, as well as many friends over the years. He hopes his service might prevent such deaths.